I couldn't find this mark anywhere. 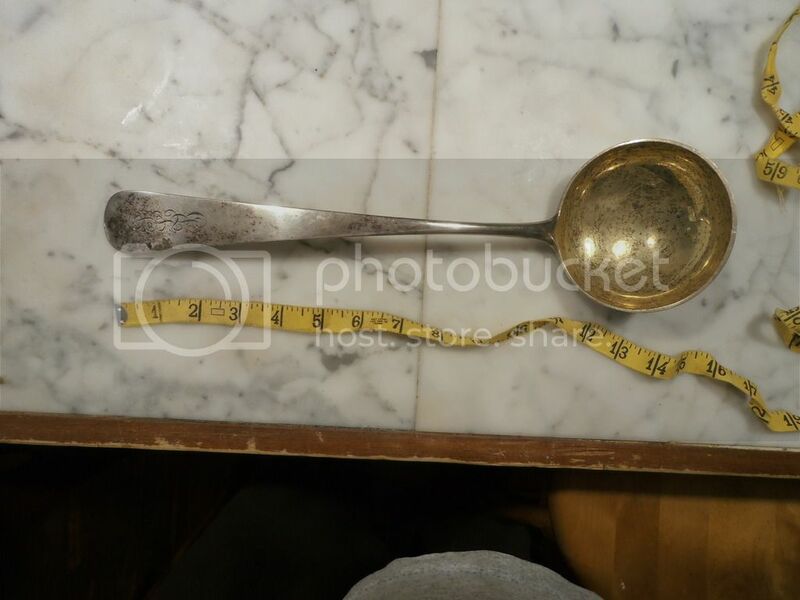 Large (14") gilt-bowl ladle, over 200 grams, with a mark and maker I can't ID. Name looks like Pastorini. Has anyone a clue? Why do think it could be Italian? What about ''silver plate'' possibility ? Have you tried the acid test? Process of elimination mostly. Mark not consistent with it being from US Canada or Mexico, England or UK, Germany, Russia, or Asian which are the ones I normally run into. And I've read Italy pre 1934 had no national mark and different marks for different parts of Italy so thought it might be that. 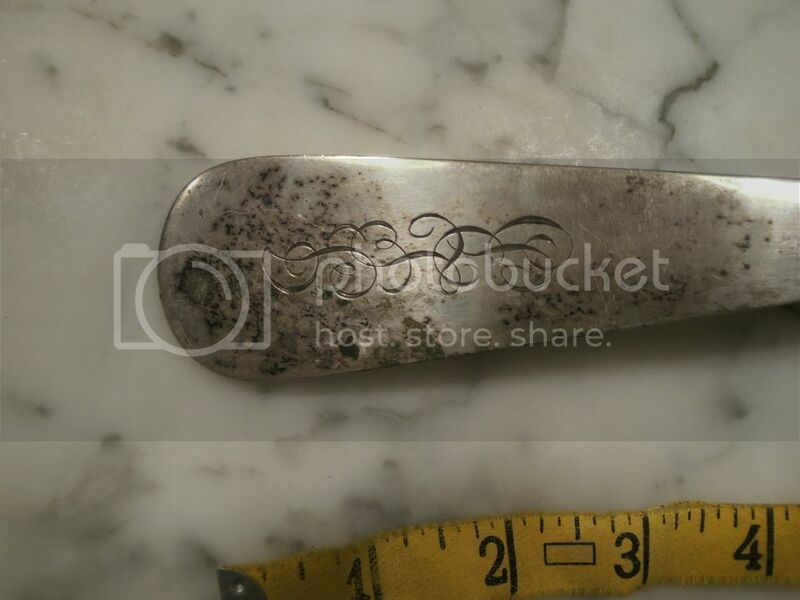 Could be plated, but it doesn't look or feel like it to me (and I've bought enough silver to have a pretty good sense of it), plus no sign of plating wear. If no one recognizes the mark I'll test it, but I use specific gravity not acid since I don't want to scratch and damage it unnecessarily and if you don't scratch it your test is worthless anyway. Just a shot in the dark.... A Giusto Pastorini of Florence, who was in partnership with Antonio Zaccaria, noted as an exhibitor of silver objects at the Italian Exposition of 1861. Pastorini Giusto e Zaccaria Antonio, Firenze.— Oggetti in argento. Very interesting. I've never seen this mark before. The punching has a definite Tuscan feel, but the L might suggest Lucca instead of Florence. However I do not know what the 6 can mean. 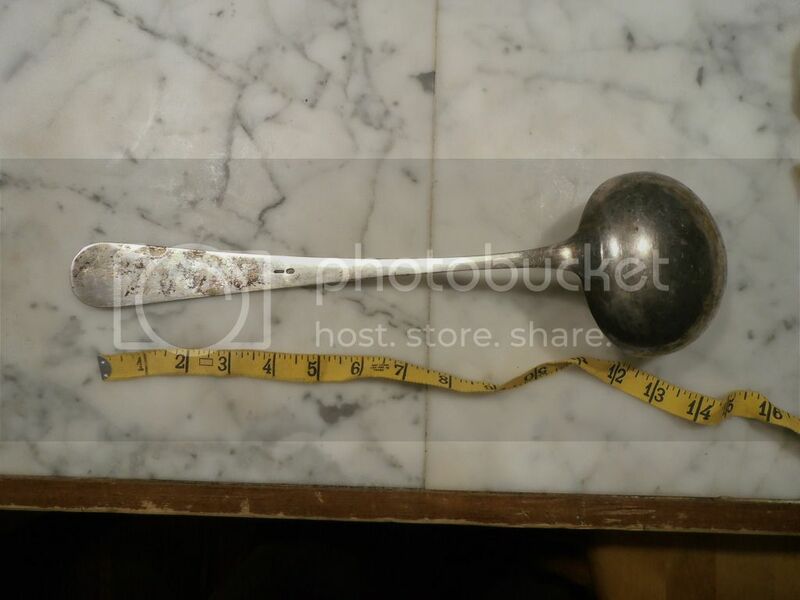 We are eager to have the confirmation that the ladle is solid silver, as it seems. In the case of Naples the numbers, 7 or 8, and previously 3,4, and 5 indicated a a fineness. I have no information of a similar use in Tuscany. Thanks for all the input. Unfortunately I couldn't find anything online about Giusto Pastorini. Are there any books that might be useful? 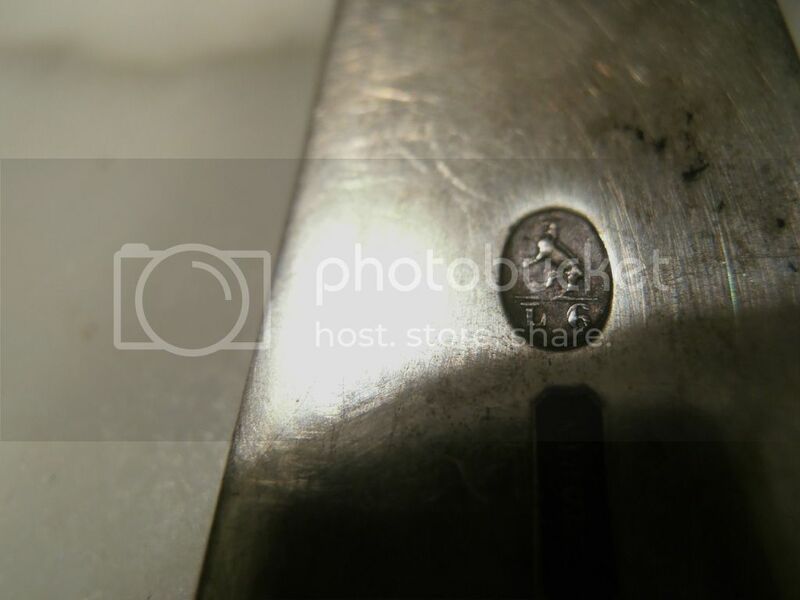 Why does there seem to be so little info on Italian made silver? Since there was some question about material, I pulled out my scale and bucket of water and did the specific gravity test on this and a few other pieces last night. I found this is pretty clearly silver and not plated: specific gravity of 10.2. A German bowl marked 800 tested at 10.0 done to confirm my math. What could that animal mark be? Does it look like a horse to you? The confirmation that the ladle is definitely solid silver is very important. Since 1832 in Tuscany there was no binding legislation, in fact with motu proprio of July 21, 1832, the Grand Duke makes the warranty punching optional, with the following mark, which, as you can see, is stylistically very similar to yours. The letters changed from city to city: F for Florence, S for Siena, L for Lucca ..... etc. 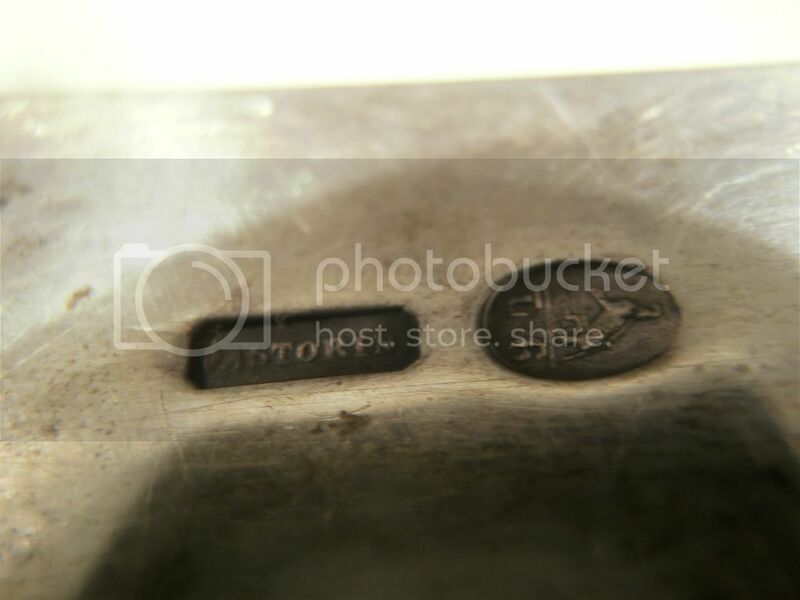 These marks could be punched, if required, only for the unique certifiable title, ie 9 ounces and 12 deniers per pound, equal to 792 thousandths. All works different fineness, both national and foreign, could not be legally punched in any way but circulated freely within the borders of the Grand Duchy according to "... the pleasure and the choice of the buyers whose diligence will be due to verify the intrinsic value and fineness ... ". 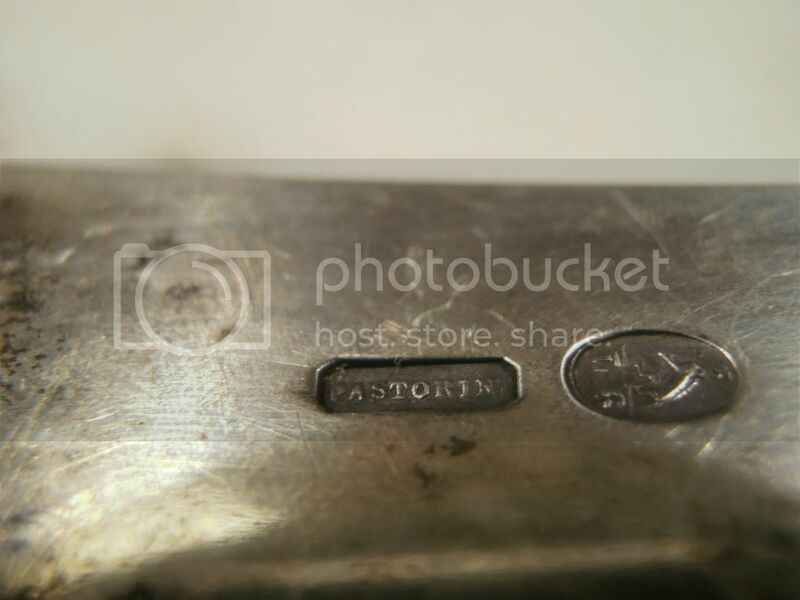 Also, after the annexation of the Grand Duchy of Tuscany to the Kingdom of Italy, and until 1935 it was not mandatory to affix warranty marks on the silver artifacts, but surely everyone could put his own trademark. In a situation like this it is difficult to say whether that mark was the trademark of Pastorini or something else. As I said the thing is very interesting and I wrote to the most famous authors of books on the Tuscan silver to have a comparison. It will be my care to publish any news that I can find. As I said, I asked four super-experts of Tuscan silver, three university professors and a very famous jeweler from Florence. Everyone kindly replied to me, but no one has ever seen this mark or a similar one. It's very complicated, it seems. As I explained in detail in my post on the gravity test, I do not think it is reliable to determine exactly the fineness of a piece. If you had the result of a more scientific test in the future, it would be interesting if you will publish it here. In the meantime any further information on this ladle can be useful: if there are cutlery with the same mark or other cutlery found together, what is the origin, etc. But I will continue my research stubborn as a mule.